If you're a fan of Banana Bread, this little cookie will be your new favorite! Like little bundles of moist banana bread, these cookies have lots of sweet banana flavor, combined with ground oatmeal flour for texture and tiny chocolate chips. A couple of these, with a morning cup of coffee and you'll be ready to tackle the rest of your day. The ground oatmeal flour is something I started using for regular Banana Bread, and it's very easy to make. Instead of spending a crazy amount of money on already ground oatmeal, I make it myself. When Old Fashioned Quaker Oatmeal goes on sale, I stock up, then grind the oats into flour using a coffee grinder. I've been doing this for years and I can never figure out why people pay so much for pre-ground oat flour. It's super easy, only takes a few minutes and I can grind just a few cups at a time so I always have some ready to use. Enjoy!! Blend the butter and sugar together until creamy. Add the egg and blend. Add the bananas and baking soda to the butter mixture and blend until combined. Add the flour, oat flour, salt, cinnamon, nutmeg and vanilla, blend the mixture again, then stir in the chocolate chips by hand, mixing just until combined. Drop by heaping tablespoons onto the lined baking sheets, keeping about 1-1/2 inches between the cookies. Bake for 12 - 14 minutes or until golden. 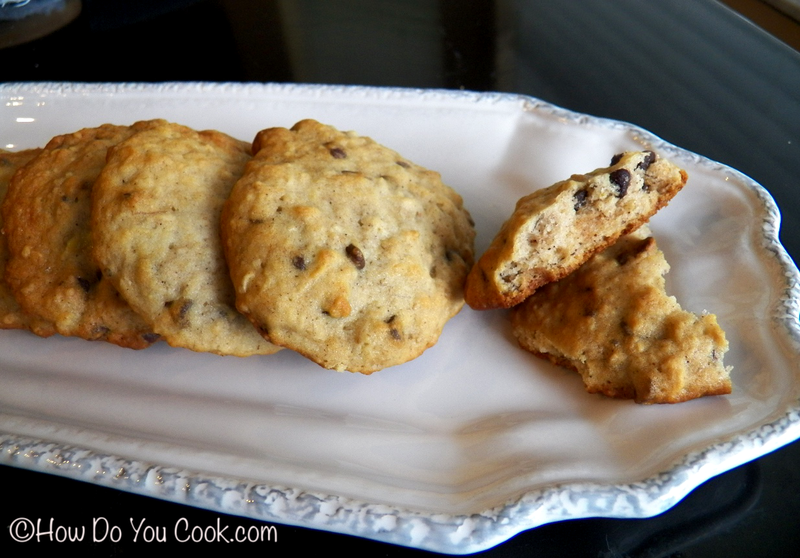 Let cookies rest on warm sheets for 2 minutes, then remove to a wire rack to cool. Makes about 2 dozen cookies. Store in an airtight container with waxed paper between the layers.